I will be blogging about my Sunday buys as soon as I transfer the pics from my camera. I told my sister I won't be coming with her to the mall and that we'd just meet her for dinner. One reason is that I was too lazy to take a bath and another coz I didn't want to burn my (and Mich's haha) wallet again. But, I didn't know there's an ongoing bazaar in Eastwood! So ayun napagastos na naman. Boo! I'll show you my super fasyon black dress on my next post. I also spent P10K on my tooth! A nightmare again! My dentist Jopek is super sad coz she worked super hard for that particular molar tooth. But I felt sadder than sad coz it's expensive ha! In fairness, it did went through a LOT of work. Rootcanal, surgery, you name it. But unfortunately bones didn't grow to hold it up and my gums just gave up. So my tooth split and thus it's extraction. So I had no choice but to say yes to permanent dentures. One temporary tooth was not enough so we had to bridge it with my 2 other teeth. I feel so poor now. So here I am in the office still trying to accustom myself with my new false teeth (good ID when I die a horrible death) while reading emails when April popped in my YM giving me the link of a nice resort (ala countryclub ang dating). I'm still not over my weekend spa nightmare. Sooooo-- we booked another weekend getaway!!! Pangbawi ba. Haha. 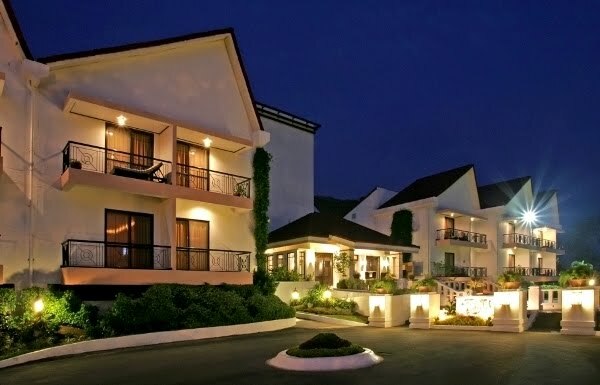 We'll be spending the weekend in Thunderbird Resort in Rizal. I'm sure it'd be super worth it this time. And it's even cheaper than what I paid in Callospa. They have an infinity pool, jacuzzi, bars, casino, beach, golf course and some other very nice view. Our room has it's own balcony too. AND the room rate includes a free 15 minutes massage and breakfast. Yipee! restos, bars, massage, jacuzzi, pool? what were you thinking?